Azure skies, fluffy clouds, rolling hills covered with bright yellow rapeseed blossoms and the teal-coloured Qinghai Lake. It is the third day of my five-day, 350km ride around China's largest lake - which covers an area more than six times of Singapore - and I finally get to see the scenery I was promised. With the sun shining brightly, I pedal steadily on my mountain bicycle along the western shore of the lake, riding very near the waters, and finally feel confident enough to stop to take pictures. The guide of my cycling group, an athletic young man who speaks Mandarin with a Shandong accent, had warned us repeatedly not to stop at will unless we can catch up. The day before, I rode for more than eight hours, covering about 100km in mostly rainy weather, including outright downpours. This is miserable weather to be outdoors even at sea level. At altitudes averaging 3,200m, the lower air pressure makes the air feel thinner. I have to constantly take in big gulps of air and often perspire under my bulky rain jacket. Even though I consider myself fairly fit for a middle-aged woman, I have not been keeping up with my running, strength training and yoga regimen and a multi-day cycling trip had seemed daunting initially. But a friend had gone on the cycling trip in May, when the weather was just about warm enough to cycle outside on the Tibetan plateau, and could not stop raving about it. When I told him about my concerns, he said: "Auntie, some tourists ride around on Mobikes." So I put down 1,990 yuan (S$400) for a package in July that provides round-trip transport from downtown Xining to Xihai town (the starting point of the circuit on the north-eastern side of the lake), four nights of lodging in a standard twin-sharing room and rental of a mountain bike, helmet and gloves. My cycling buddies range from school boys from southern Guangzhou to sporty couples in their late 40s from eastern Hangzhou. A newlywed couple from north-eastern Changchun are toughing it out as part of their honeymoon. A safety vehicle follows us carrying our belongings and cartons of bottled water, always ready to give a lift to those who are too tired to continue cycling. The first day is essentially a warm-up session, where we test our bikes and take a leisurely 8km ride around Xihai town, where China's first atomic and hydrogen bombs were designed and developed. The entire route has hardly any traffic lights and, for the most part, the road ahead looks never-ending. We ride past herds of yaks, sheep and horses, sometimes sharing a narrow path with these grazing animals. Far more tourists go around the lake on four wheels rather than two. Some of them can be more hazardous than the animals, driving dangerously close to us, cutting abruptly into our paths or simply honking loudly at us for no reason. Another hazard is the roadkill. We often see flattened sparrows, squashed grassland rodents and other unidentifiable carcasses on the road. A couple of times, I have to swerve or brake abruptly to avoid a rodent that appears out of nowhere. The highlight is the excursion on the third day to the Chaka Salt Lake, a hypersaline lake where we wade in the shallow salt water that comes up to just a little below the knees, walking on the thick salt crust. My fellow female riders change out of cycling gear into flowy bohemian dresses, complete with straw hats. "According to my research, 90 per cent of female visitors wear red," says one of them, adding that the colour provides the best contrast against the backdrop of rolling clouds, blue skies and clear waters. True enough, many visitors are in red and at least two are wearing the same outfit. Besides trying to look pretty, many also cover up with scarves, jackets and neck gaiters to avoid sunburn. While the temperature is only a mild 20 deg C, the afternoon sun and the reflection from the blinding white salt make it seem hotter. To get a perfect shot of you and your reflection in what is known as China's "Mirror of the Sky", you have to enter the lake, where the water is around knee level. The guide repeatedly warns us not to fall into potholes that look like black depressions in the salt. But I fall into one, scraping the back of my left heel rather badly. On the fifth and final day, I am feeling good after getting used to the constant cycling and the arid but pristine air. I am ready to go up the biggest and longest hill on the cycling route. My young friend - a recent high-school graduate who goes by the nickname Zhu Zhu - complains bitterly that the guide has lied to us. "It was 3.8km of steep uphill, not 3.7km as the guide had told us," he grumbles after catching his breath at the top of the hill. But the final 20km of the ride is an easy downhill stretch where we can let gravity work its magic and wrap up four days of hard work. In those few days, we ride with the wind, against the wind, in the rain and under the sun, experiencing all sorts of weather conditions. This high-level cycling trip is somewhat strenuous for a non-cyclist like me. But if you are fairly fit, you can definitely nail it with some effort. Just do not attempt it on the no-frills Mobikes. There are no direct flights from Singapore, but local carriers fly to Xining, provincial capital of Qinghai, daily from south-western cities like Kunming and Chengdu, and southern cities like Guangzhou. Xining is well connected to major cities in the western region via high-speed rail. It takes four to five hours to go to Xining from Xian. Qinghai Lake is about 150km, or about a 21/2-hour drive from the city. If you join a biking tour, round-trip transport from the city to a local town by the lake will be included in the package. 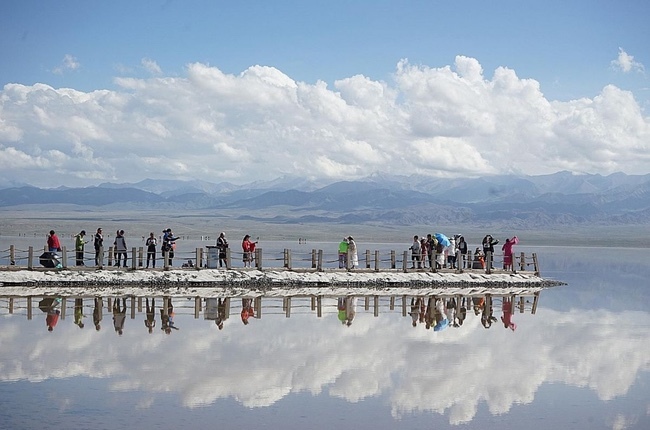 •The peak season to visit Qinghai Lake is the summer months of July and August. While food and lodging can get pricey, this is also when hectares of rapeseed flowers are in full bloom. •While Qinghai is an arid region with minimal annual rainfall, there may be some rain during the summer months. Prepare a full set of waterproof gear - hat, jacket and pants. But do not forget the sunglasses and sunscreen. •Temperatures in the highlands can drop as low as 7 deg C even during summer. Fleece and even a light down jacket will come in handy in the mornings and at night. •Local inns and hostels can be basic. Pack a full set of toiletries, towel and sleeping liner for peace of mind. •Food around the lake is mostly Sichuan cuisine or local Hui (Muslim) fare with lots of meat - yak, beef and mutton. A must-try is the handmade yogurt, sometimes touted as being made from yak milk.